This is way too technical for me to express an opinion. Calculations and simulations confirm that on average, Mercury is the nearest planet to Earth—and to every other planet in the solar system. I was surprised to learn in Sky and Telescope a few years ago that Mercury was most often the closest planet to Earth. There is so much fuss about Martian close approaches and I knew Venus comes the closest of all the planets to Earth. Because Mercury does not get too far from Earth, it is most frequently the closest planet to Earth. But that's the thing, it's a trivial result that for any given planet, any circularly-orbiting object arbitrarily close to its star (with the limit being the star around which the planet under consideration orbits) will be closest to it on average. You can even see it intuitively: as you plotted, the sinusoidals will start getting flatter and flatter until you reach a flat constant line (the system's star), while any other circularly-orbiting object farther from the star will be closer at some point of its orbit, but also diametrically-opposite the star at some other moment, increasing the average distance for at least half of its orbit. Unless you're considering something in the planet-star Lagrange points, this is the case for a suitably long time period (to account for close-coorbiting bodies) for any planet, star and distance considered, provided it's a circular orbit as the article considers. 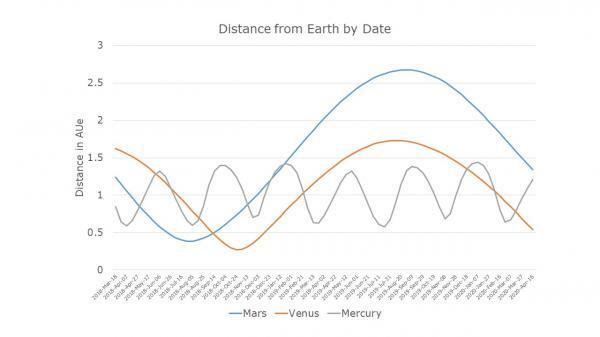 The farther the considered planet orbits, the clearer this effect gets - hence why Mercury is the closest planet, on average, to *any* of the Solar System's planets, and even to Pluto whose results gets a bit more complicated due to eccentricity and plane inclination issues. Talking longer term I think there is a possibility that the Earth will see an uptick in impacts over the next million years as I was reading an article in Astronomy Now January 2019 issue that there is a theory that Gaia data will show that Scholz’s Star went further into the Oort Cloud 70,000 years ago than initial calculations showed. That the information to prove or disprove this theory will be in the next Gaia data release. On March 6, 2019, our Solar Dynamics Observatory, or SDO, witnessed a lunar transit — where both the Sun and Moon displayed a little odd behavior. First, there was the transit itself. A lunar transit occurs when the Moon passes between SDO and the Sun, blocking the satellite’s view. But instead of appearing on one side of the frame and disappearing on the other, the Moon seemed to pause and double back partway through crossing the Sun. No, the Moon didn’t suddenly change directions in space: This is an optical illusion, a trick of perspective. Here’s how it happened: SDO is in orbit around Earth. When the transit started, the satellite was moving crosswise between the Sun and Earth, nearly perpendicular to the line between them, faster than the Moon. But during the transit, SDO started the dusk phase of its orbit — when it’s traveling around towards the night side of Earth, moving almost directly away from the Sun — but no longer making any progress horizontally to the Sun. The Moon, however, continued to move perpendicular to the Sun and thus could “overtake” SDO. From SDO’s perspective, the Moon appeared to move in the opposite direction. The second, subtler part of this celestial dance seemed to come from the Sun itself. If you look closely, you may notice the Sun seems to wiggle a bit, side-to-side and up and down, during the transit. That’s another result of SDO’s perspective, though in a different way. SDO relies on solar limb sensors to keep its view steady and focused on the Sun. These limb sensors consist of four light sensors arranged in a square. To keep the Sun exactly centered in its telescopes, SDO is trained to move as needed to keep all four sensors measuring the same amount of light. But when the Moon covers part of the Sun, the amount of light measured by some of the sensors drops. This makes SDO think it’s not pointed directly at the Sun, which would cause SDO to repoint — unless that function gets overridden. Since SDO’s fine guidance system wouldn’t be much use during a lunar transit regardless, the mission team commands the spacecraft to disregard limb sensor data at the beginning of such transits. This loss of fine guidance accounts for some of the Sun’s apparent movement: SDO is now pointing at a general Sun-ward spot in space, instead of keeping its view steady using the much more accurate limb sensors. The other factor behind the apparently wiggly Sun is temperature. SDO’s instruments are designed to work in the full glare of the Sun’s light and heat. When the Moon’s shadow passes over the spacecraft, the instruments quickly cool in the vacuum of space and start to bend and flex. The flexing of the front part of the telescope can make it look like the image is moving around in the frame. SDO’s operators use strategically-placed heaters onboard the spacecraft to minimize this flexing as much as possible and to get back to providing science-quality data — images that are focused, centered and steady — as quickly as possible. Astronomers studying some of the most ancient light in the cosmos have found 83 ancient quasars in a field where only 17 were previously known, an indication that supermassive black holes must have been relatively common in the extremely early universe. The discovery, using the Hyper Suprime-Cam wide field camera mounted on the Subaru Telescope, required 300 nights of observation time over five years. Referring to the above article something is clearly wrong and it looks to be the standard model. On Dec. 18, 2018, a large "fireball" - the term used for exceptionally bright meteors that are visible over a wide area - exploded about 16 miles (26 kilometers) above the Bering Sea. The explosion unleashed an estimated 173 kilotons of energy, or more than 10 times the energy of the atomic bomb blast over Hiroshima during World War II. I don't need to develop a model calculating the coordinates of the North Pole relative to asteroid Itokawa during a million years to know that model doesn't describe anything generally useful. Replace 'North Pole' with 'Nagano Prefecture', you have a useful tool for signal strength between Usuda ground station and Hayabusa. Plenty of "that's dumb / it's so obvious / everyone knows that / why would anyone ever bother to calculate that?!" research turns out to be useful. For Mercury being the average closest planetary body to all other planetary bodies (and most minor planets sharing the same plane) it may mean that designs for a system-side data relay network may have a reason to place a node in Mercury orbit (or somewhere nice and shielded like a shadow-skirting Lissajous around Mercury-Sun L2). No, because the analytical "method" they used only works for circular orbits (Itokawa's e=0.3) and considers point-like objects. My comment was a hyperbole, and furthermore you decontextualized it from the intended meaning, i.e. I don't need to create another unuseful model to understand theirs is. There still are analytical exact formulas, not too complicated to derive even if cumbersome, to get that distance. Discovered hundreds of years ago. Using standard trigonometry. Could even add a phase for Earth's rotation and account for day/night cutouts. Mercury would only make the slightest bit of sense if used as a shade as you mention - otherwise you can just use any orbit close to the Sun for minimizing average distance to other circularly-orbiting bodies. Although I would argue you'd be more interested in minimizing the r^2 losses for smaller periods (or just using several relays) rather than having huge losses all the time which, funny fact, turn out to be smaller on a "yearly" average, when that "year" might last hundreds of Earth years. The Sun would still be in the middle for a significant portion of the orbit. And this week’s way out physics theory is there is no reality only information. It would be more accurate to describe the theory as saying that the only reality is information. You are quite correct that’s a more accurate description than mine. Because of constant pressure from the sun, a space rock beyond Mars is spinning so much that it's literally cracking up. Mars is dry today, but numerous precipitation-fed paleo-rivers are found across the planet’s surface. These rivers’ existence is a challenge to models of planetary climate evolution. We report results indicating that, for a given catchment area, rivers on Mars were wider than rivers on Earth today. We use the scale (width and wavelength) of Mars paleo-rivers as a proxy for past runoff production. Using multiple methods, we infer that intense runoff production of &gt;(3–20) kg/m2 per day persisted until &lt;3 billion years (Ga) ago and probably &lt;1 Ga ago, and was globally distributed. Therefore, the intense runoff production inferred from the results of the Mars Science Laboratory rover was not a short-lived or local anomaly. Rather, precipitation-fed runoff production was globally distributed, was intense, and persisted intermittently over &gt;1 Ga. Our improved history of Mars’ river runoff places new constraints on the unknown mechanism that caused wet climates on Mars. A peculiar new paper, published in a little-known scientific journal, has the tabloids stirred up about the possibility of life on Mars. According to this paper, an international team of scientists are now claiming to have found evidence of 'mushrooms' growing on the surface of the Red Planet. The 'evidence' is primarily based on images, taken by NASA's Curiosity and Opportunity rovers, which capture a birds-eye-view of what look like, well, mushrooms. Interesting title on the paper.